We are all hoarders at heart. We love to keep things we don’t really use or need, especially if they have sentimental value. And other things we keep or buy simply because they look pretty. Well, there’s a way of turning part of your collection into a decorative musical instrument: a wind chime. Dig into your collection and you’re sure to find tons of ornaments and accessories that you’re holding onto for no other reason than that they are aesthetically pleasing. 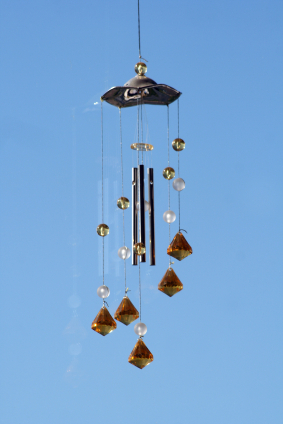 For the wind chime, you can gather old earrings or pendants that you no longer use; a belt buckle or a brooch; a plastic Easter egg you picked up at the dollar store or Christmas tree ornaments that you might enjoy year-round. The choices are many and really, anything can work. The whole point is to use what you’ve got. Cut a piece of Styrofoam in a rectangular shape, the size depending on the number of decorative ornaments you’ve collected and where you think you’ll be hanging the wind chime. Grab a piece of opaque cloth and cut it out to exactly fit the rectangular Styrofoam, gluing it along the edges using a glue gun. For a cleaner finish, avoid using too much glue. The next step is to poke some holes through the bottom edge of the rectangle, using a scissors blade or metal skewer. That is where the strings will go. Plastic string is very fine, so there is no make a wide hole; if you’re using ribbon, you’ll need something a little wider. Cut various lengths of string (to give your wind chime more movement) and tie a piece to each ornament, along with a bell. Then, poke the other end of each ornament string through a hole in your Styrofoam. Double-knot the string around the hole. Your wind chime does not need to look like a collection of old ornaments. You can colour-coordinate the ornaments you pick, and match the covering cloth with the area surrounding the chime. For a more sophisticated finish, you can spray-paint your bells in brass metallic (for a rustic feel) or other colour, rather than leaving them bare metal. Satin ribbons, braided thread, or coloured yarn can also be chosen to complement the rest of your decor.